The Pantry Market takes place on the last Saturday of every month in The Atrium of The Trumpet on Keyes building from 9:00 – 14:00. Rosebank’s art and design district, Keyes Art Mile, has become home to a new monthly food market – The Pantry Market at Keyes. Taking place on the last Saturday morning of every month, the market specialises in small-batch, artisanal food products for you to take home and stock your pantry with. It brings to the district everything from olive oil and honey to fresh produce, charcuterie, confectionery, sourdough bread and whole grains. The next Pantry Market will take place on 28 April 2018. 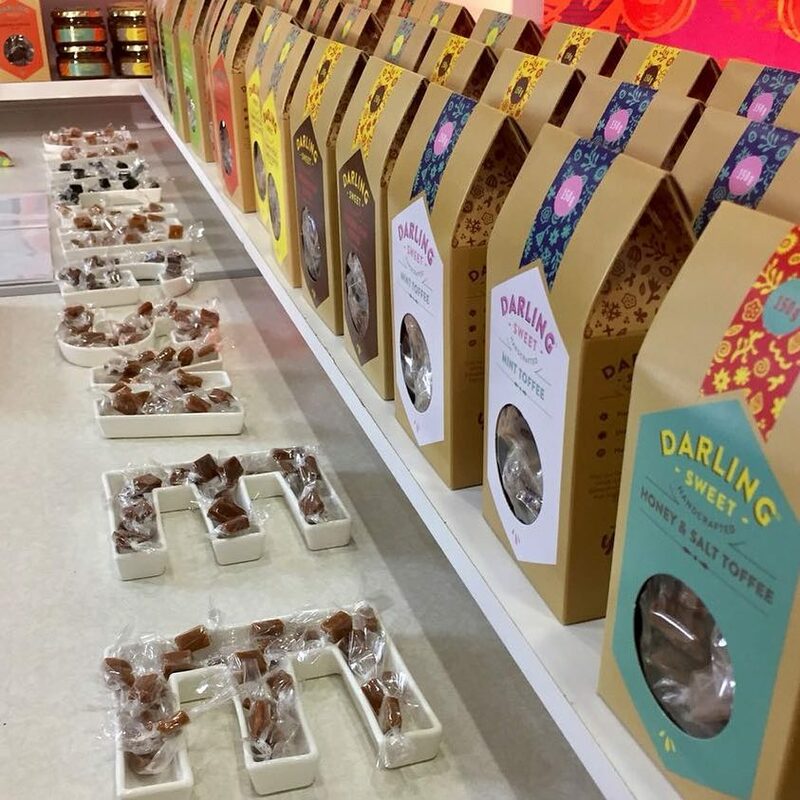 The inaugural edition in March was a resounding success, with visitors flocking through the doors, and exhibitors experiencing a powerful new platform from which to sell their produce & products and share their stories. One of the highlights of The Pantry Market is the talks programme. Each month visitors can attend a free food-related talk by an industry expert. Topics include ethical eating, reducing your plastic-use, plant-based diets, and more. The upcoming talk, on 28 April at 10h30, will be by Karen Dunn, owner of Urban Apiary, who will discuss everything from the questions you should be asking about supermarket honey, to why every city needs healthy bees, and gardening tips to promote bees. The market is a plastic-free zone, and visitors can shop top-quality, ethically produced products in a relaxed, curated space, in which they meet the makers, sip, sample, snack and enjoy live music. They can even bring their own glass jars to fill with milk and honey. To complete the experience, breakfast and lunch are available from the several Keyes Art Mile restaurants, including BGR, MESH Club, Milk Bar and Marble. While SMAC and the TMRW gallery offer additional visual stimulus to the morning, True Design (Kartell, Moroso and Cassina), Okapi, Shelflife and Anatomy will be open for browsing and shopping. Bakgat Nartjies: Nova naartjies and Eureka lemons farmed in the North West for export. Dolci Café: Freshly rolled pasta and homemade sauces as well as a selection of pastries. Bring back your glass jar and receive a discount next time you buy sauce. Esposito Natural Foods: Acorn fed, free-range pork products from the Midlands farm of Franco Esposito. Gudgu: A selection of sugar-free and regular cordials to enjoy on site by the glass and take home by the bottle. Juice My Roots: Cold-pressed, energising juices made from ingredients as wide-ranging as fennel, radish and pear. Kula Organics: Fresh, organic, seasonal produce sourced from local Joburg farmers. Lorian’s Cheeses: A carefully curated selection of artisan cheeses from around the country. Enjoy a platter on site or buy cheeses to take home. The Grainery: Whole grains such as buckwheat, quinoa and black rice, sold in eco-friendly muslin bags, as well as a selection of healthy, fresh bowls to enjoy on site. Tonka Bean Patisserie: Croissants, donuts, and pastries from the famed Riversands bakery. Treviso Café: Top-quality sourdough bread, using stoneground flour, water, yeast and salt, and nothing else. Yield Coffee: Espresso-based coffee drinks (including hot chocolate & chai latte) prepared by professional baristas. Coffee beans also available to take home. Yococo: Dairy-free handmade ice cream using only organic fruits and free from all preservatives and colourants. Urban Apiary: Raw, small-batch honey harvested responsibly from the suburbs of Johannesburg. Bring your own jar to fill, or buy a filled jar on site.